It’s been a while, but I want to wrap up my series on Azure SQL Databases and Powershell. In my last post, I talked about how you can make point in time backups of Azure SQL Databases using the Start-AzureSqlDatabaseExport. This process allows you to make a backup of your Azure SQL Database and store it as an Azure blob. You can then restore these backups using Start-AzureSqlDatabaseImport. 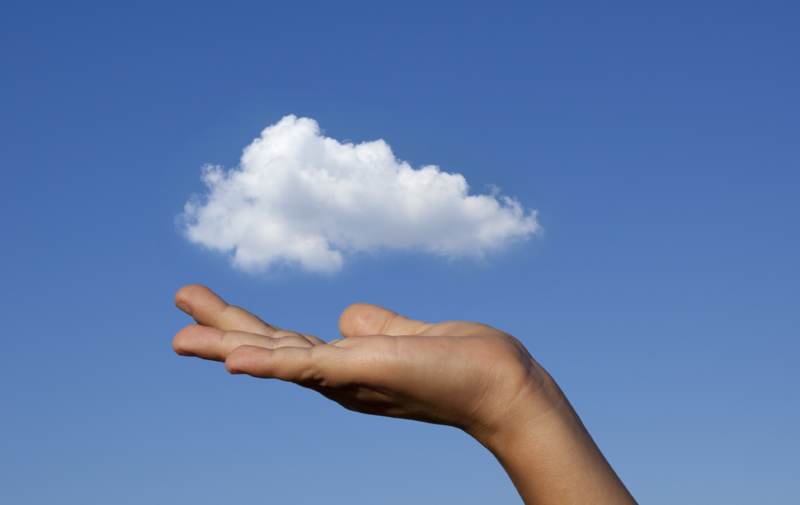 It’s all very handy to manage your data within the Azure environment. 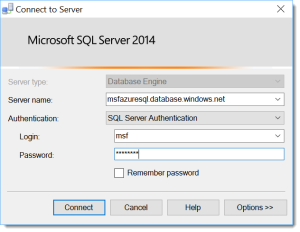 Now let’s talk about what I alluded to at the end of that post: using this process to migrate data from your traditional SQL Servers to Azure SQL databases. As we have previously discussed, Azure SQL Database does not support traditional backups as we are used to with regular SQL Server. While there’s a debate on whether or not these should be supported, the reality is that we need another process to handle this. This is where the export/import process comes in. DACPAC – A binary file that contains the logical database schema and possibly the data. This file retains the platform version of the database (i.e. 2012, 2014, 2016). BACPAC – A binary file that contains the logical database schema and the data as insert statements. This stores the platform version, but is not locked into it. The DACPAC extract is useful for managing your database code. These objects can be source controlled and, using SSDT, can be used to compare to a current database state and deploy changes. I’m a big fan of using DACPACs to manage my database code and maintain code consistency. I don’t use the data extract portion, but it’s there if you need it (more on this in a later blog post). BACPACs are a little more limited. They contain the schema and your data in a logical state, as insert VALUE statements to populate your database objects. The advantage is you get a flexible package that can deploy a database and its data to almost any SQL Server platform (with some caveats, which we will get to). The disadvantages are that the BACPACs are not as efficient as native backups and are not transactionally consistent. What this means is that BACPACs are not really suited for day to day backups of your database. They are intended to be a migration tool, especially if you are working with disparate versions of SQL Server. It is why they’re intended for moving databases to Azure SQL Database, because a BACPAC can move your database logically and you are not reliant on the underlying database architecture. Which brings us to the caveat. While BACPACs allow us to move a database logically, it can not always take into account unsupported features. We can export a database from our SQL Server, but if we’re using something not supported in Azure SQL Database (such as CLR or Service Broker), then this migration will not work. If you are planning this sort of migration, you first need to review your databases for these issues. Once we’ve got our .bacpac file, we need to get it up into Azure. For this we need a storage account, then it’s just a matter of copying the blob. For this, we will use the same storage container we used for the exports before. We will create a storage context for the storage account, then use Set-AzureStorageBlobContent to upload the .bacpac file. Notice I save the output of Start-AzureSqlDatabaseImport into a variable. This is an object requesting the import request, which I can use to check on the import. Remember that calling the cmdlet starts an asynchronous process that will import the schema and data of the .bacpac into your newly created database. We’ll want to check on the process to identify when it completes. Generate a deploy report targeting the Azure SQL database. If no changes are shown, the schemas match. Since no changes are listed, there’s nothing to do and everything matches. Again, if everything worked correctly we shouldn’t get any output. I should stress that these two checks do NOT replace thorough regression testing. These should give you a starting point to verify that your migration was successful, but you still will want to test your applications and processing. Now, while I would like for Microsoft to include some native cmdlets that accomplish these actions, it should be noted that sqlpackage.exe is a pretty solid tool. It can be used from the command line and wrapping PowerShell around it is still effective. The key is having something I can use from the command line so I can write repeatable scripts. This is important because Azure is driven by automation and, while we can use GUI tools and the portal, we won’t succeed long term in the cloud on these tools alone, so it’s important to understand all the options. Last week, as I watched the Twitters, I saw an interesting blog post from Julie Koesmarno(@MsSQLGirl) about creating alerts for Azure SQL Database. These are cool because one of the many things I get asked about when talking about Azure SQL Database is “how do I monitor this darn thing?” With these alerts, you can monitor performance, capacity, and security settings, setting up either email notifications or webhook responses. Now, me being me, I tweeted out that it would be cool to do this in PowerShell. I say this not just being a geek about the language, but also because if you want to live in the cloud you need to up your automation and scripting game. PowerShell is the way to manage your Azure resources, especially if you want to set up consistent alerts for all your Azure SQL Databases. Julie pointed me to some examples that, while not specific for Azure SQL Database, got me moving in the right direction. I’d like to share some of that learning here. To start, we need to know what cmdlets are at our disposal. 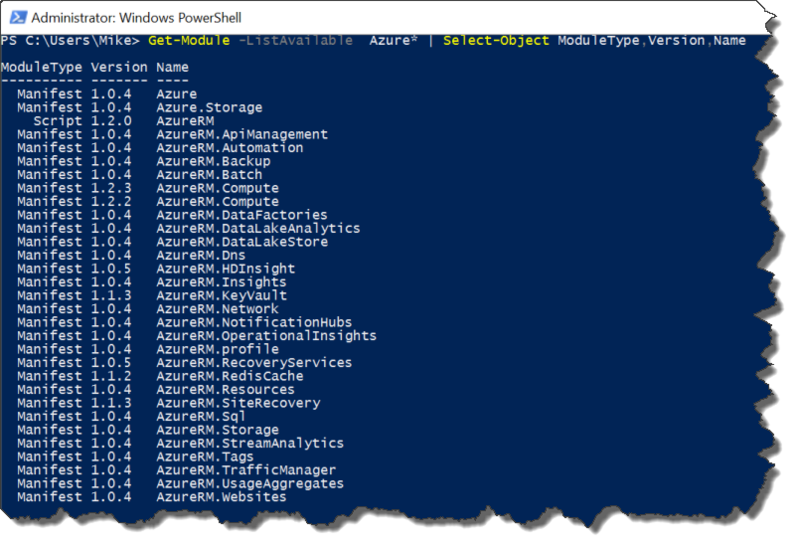 You’re going to need the Azure and AzureRM modules first (I recommend using the Powershell gallery installation) and then we just need to use PowerShell’s command syntax to find what we’re looking for. Using Get-Command, just do a wildcard search around ‘Azure’ and ‘Alert’ as my search terms. It’s not a long list, but we don’t need much to get our work done. It should be noted that these are generic and can be used across all Azure resources. Because these cmdlets are generic, we have to identify the specific metrics we can monitor for Azure SQL Database. Fortunately, these are discoverable using the Get-AzureRmMetricDefinition, which is not listed but part of the AzureRM.Insights module (use Get-Command -Module AzureRM.Insights). To use it, we need to know our Azure resource ID, which we can derive from three pieces of information: the resource group, the server name, and the database name. Most of these Name values match what Julie listed in her post, but the nice thing is if we ever get new ones, we can look them up with this method. The Resource Group we will create the alert in. An Azure location where the alert will live. An Azure SQL Database server and database we are creating the alert for. What metric we will monitor and what is the threshold we will be checking. (optional) An email to send an alert to. There are a couple other considerations for creating an alert. The first is a time window the alert will check against. This window can be anywhere from five minutes to a full day. The second is what aggregation of the metric we will check (i.e. total, average, maximum). You’ll want to use values and aggregations that make sense, but for the example alert, we’ll check the maximum value over a 5 minute window. As you can see managing alerts in PowerShell isn’t all that difficult. The question is “why”? Hopefully you can already see the value, especially if you want to standardize your Azure SQL Database environment. By having all your alerts scripted out, you can apply them in a consistent fashion. This can be part of a larger automation process that helps scale out your environment as necessary. Regardless of how you manage it, using PowerShell can significantly decrease your management time for your Azure environment. Thanks again to Julie for giving me the inspiration to figure this out! Previously we went over how Azure handles regular backups of your Azure SQL Databases. It is such a huge weight off an administrator’s shoulders when we only have to worry about restoring a database if something goes wrong. While many DBAs might struggle with letting go of the need to control and manage their backups, I think most of us will embrace the freedom from the tedium and worry of keeping an eye on this part of our disaster recovery. There still is a need to take a backup of some sort. Over my career, while I have used backups for protecting my data, I have also used them for other tasks. Sometimes it is to snapshot the data at a point in time, such as before a code release or a major change. Other times a backup can serve as a great template for creating a new application database, especially if you have a federated database model. Whatever your use case, there are times we would need to snapshot a database so we can restore from it. One approach would be to just mark down the time you want to use as your backup and restore from there, but this approach could be difficult to control and be tricky to automate. Azure offers us a better option: exporting the Azure SQL database in question to blob storage. We can restore (or, more precisely, import) this export to a new database. The only mildly frustrating thing with the export we need to use cmdlets from both the Azure module and the AzureRM module (assuming your storage blob is deployed using the resource manager model). 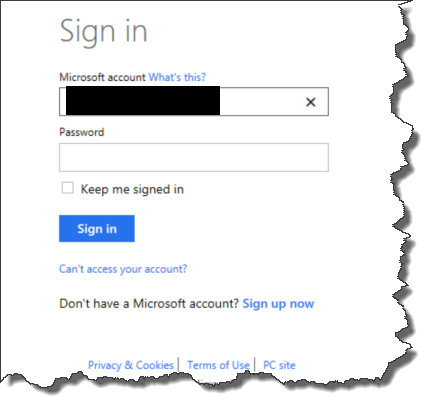 Because of this, make sure you run Add-AzureAccount and Login-AzureRMAccount before you get started. Once we have established our SQL connection context, we will then need to set our storage context using a combination of AzureRM and Azure cmdlets. Now we can then start the export. Notice, we need a name for the export, used in the BlobName parameter. Since this only starts the export, we need a way to check on the status. We can check using Get-AzureSqlDatabaseImportExportStatus. Oddly enough, the status cmdlet requires the username and password to be passed separately and does not take a credential object. And then there is our blob. There are two gotchas to keep in mind with both the export and the status. The first is you can not overwrite an existing blob, so make sure your blob name is unique (or get rid of the old one). Also, you can not check on the status of an export that has finished. If you get an error, chances are your export has completed. Once we have our export, we now have a “backup file” we can create new databases from. All we need to do is run an import of our blob. Just as for our export, we need some information for our import, which we will (unsurprisingly) run with Start-AzureSqlDatabaseImport. I don’t know why Microsoft went with BACPACs over some native format, but because they did,we can also migrate a database from on-premise SQL Server to Azure SQL database. This is a follow up to a common question I get: “How can I copy my database up to Azure SQL Database?” I want to look at this in my next post. Tune in next week, where we will create a BACPAC with regular SQL Server database and migrate it up to Azure SQL Database. I meant to write this post a month ago, but then life happened. This is a continuation of my short series on Azure SQL Database and how you can manage it with Powershell. If you want, you can go back and read the previous two posts: Getting started and creating your database. Now I’d like to show you how to connect to the database, but since it’s been so long since I’ve looked at this demo, I’ve forgotten my administrative password! While it would be simple to blow away the Azure SQL server and database, there are many situations where this is not possible. Fortunately we have an easy way to reset the administrative password using the cmdlets. Remember that your server name will be what you named it followed by “.database.windows.net”. You must have SQL Server Authentication selected, and then just enter your login and password. SSMS will then connect up to your Azure SQL Database and the rest is very much like managing your on premises databases. 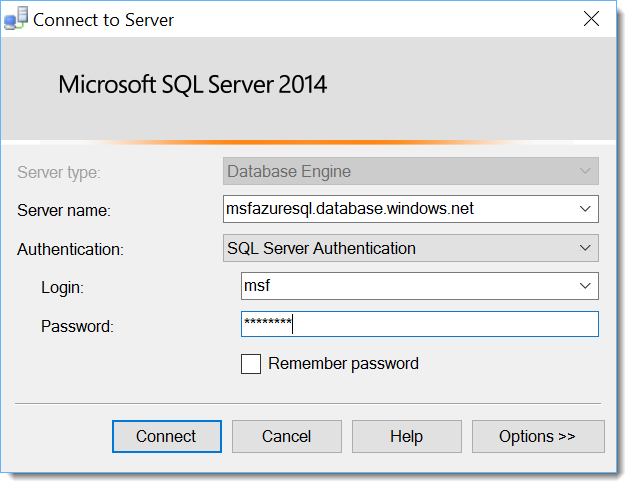 As you can see, working with Azure SQL Database after it has been created and configured is not much different than your typical SQL Server installation. There is a lot of writing out there on features and use of Azure SQL Database, so I will skip that here. The best place to start is Grant Fritchey(@GFritchey) and his Azure blog posts. The last item I want to cover here is managing your database size. One of the promises of the cloud and Azure is the flexibility to change your resources as your needs demand and not be stuck on whatever hardware you purchased when you first built your data center. There are a couple items you should consider when first creating your Azure SQL Database, but the great thing is that you are not tied into many of those options permanently. There are several service tiers available to you, with a mix between standard and premium offerings. Obviously, each service tier has a different price point, so how do you know what is the right choice for your database? What complicates this is you have a mystery metric for performance: Database Transaction Units. Ostensibly this is the number of transactions per second your database should be able to provide, but there’s more to it than that. My general recommendation is you should base your choice on features you need and user connections you expect. If you find, after that, you have a performance bottleneck, you can adapt upwards incrementally. As you can see, we can manage the access and scale of Azure SQL Database with a few straightforward commands. While these changes can also be managed through the web portal, I find the Powershell approach to not only be simpler, as we can skip all the browsing through blade windows and troublesome clicks. While these actions are not really ones we would automate, using the cmdlets can also ensure that our actions can be more precise and consistent. In my next post, I want to cover a topic near and dear to the hearts of DBAs everywhere: database restores. While backups for Azure SQL Database are managed for us, we need the ability to restore our data to a point and time of our choosing. Fortunately this is fairly easy to accomplish with Powershell. Stay tuned and I promise you will not have to wait another month for me to demonstrate this. I’m now a month into my new gig at UpSearch and loving it. The most interesting thing about moving from being a corporate world to being a consultant is the variety of work that I get to do. As tech folks, part of the reason we work in this field is because of all the things we get to learn. One new area for me has been Azure SQL Databases. Sure, I’ve known about them for a while now, but it was never something that was needed by my corporate masters. Now, with several different clients to work for, it did not take long for Azure’s platform-as-a-service database offering to be a good fit for a project. Since this is me we are talking about here, I made a point of learning how to create and manage these databases in Powershell. I’d like to share some of those lessons here. Before we get started, we need the right cmdlets for working with Azure. With Windows Management Framework 5.0, it is actually really easy to install and get started with Azure and Powershell. The full process is documented up on Microsoft’s site. It takes about 30 minutes to get everything installed and configured. What is this all about? It took me a bit of digging, but what it boils down to is that Microsoft made a fundamental change to how things are managed within Azure. You will now find documentation on these two different deployment models: Classic Deployments and Resource Manager Deployments. These two different set of Powershell cmdlets reflect these different models, as anything for Classic Deployments are handled by cmdlets in the Azure and Azure.Storage modules. All the Resource Manager Deployment stuff is handled by the AzureRM* modules. The reason I call this out is to address one major hangup with working with Azure: the documentation. Because Azure is changed so quickly, official documentation and other write ups (like this one) quickly go out of date. When I was looking for information on how to do this, I kept finding blog after blog that covered Classic Deployments. Since I am just starting with this, there is no reason for me to go down the Classic Deployments path. While these are still viable and perfectly valid, it makes more sense to me to focus on using Azure the way Microsoft intends it to be used. 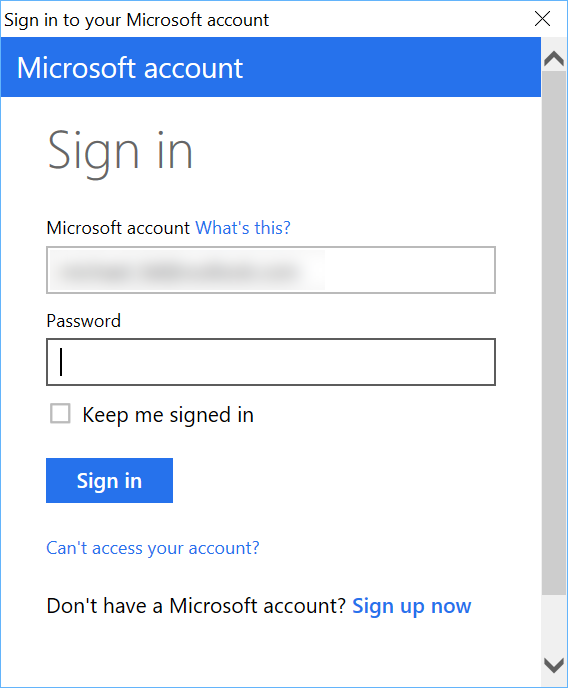 I am then greeted by a GUI login window, where I enter my credentials. Hey, wait? A GUI? With Powershell? Yeah, this surprised me as well, because to me GUIs are an aberration when it comes to Powershell. You can not really automate them and that throws a wrench into the whole works. This is probably my biggest gripe about using these cmdlets. The nice thing is that once you login your session is maintained and you can make use of a session profile. Note, the name of the file is pretty meaningless. I used the apf extension because of my own personal taste, but you can do whatever you want. The point is to have the file. Once you have this file, you can load it up in future/different Powershell sessions and avoid the login GUI completely. The real hurdle here is that, regardless of how you go about this, you need to login graphically at least once to get credentials. With our connection established, we can now start creating SQL databases. Before we do, however, we need to talk more about what we are going to create. While the beauty of working with public cloud providers such as Azure is it is really easy to spin up resources, it does not negate the importance of understanding how and what we are deploying to. It is just as important to “measure twice, cut once” when it comes to the cloud. My next post will focus on the different components that make up Azure SQL databases, deployment considerations, and how we end up creating SQL databases in the cloud.